The air cargo operations at Syracuse Hancock International Airport are located on 22.5 acres of land. Carriers have ample office, parking, and loading dock space, as well as aircraft apron areas. The airport is well equipped to meet the increasing demand for air freight service. Air cargo activity includes the handling of air cargo and express and regular mail. 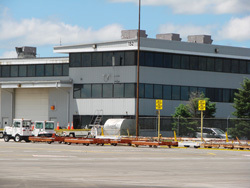 The existing air cargo facility at Syracuse is located southwest of the terminal complex. A 100,000-square-foot cargo building with a parking apron allows direct aircraft access for quick and efficient cargo handling. Air cargo companies that operate at Syracuse include Federal Express, UPS, and Wiggins Airways. Questions regarding a specific carrier should be directed to that carrier.